Global Synthetics has several products that can be successfully used in the stabilisation of coastal foreshores. Due to the unpredictability of the physical environment along all coastal locations and the increasing incidence of urban encroachment into this environment, there are increasing consequences of major damage to infrastructure. 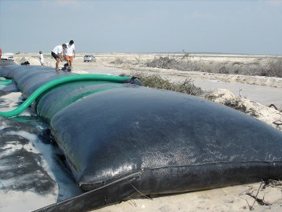 Global Synthetics has several products that include geotextile tubes (sand filled on site) and smaller geotextile bags (sand filled on site) that can significantly reduce the economic costs of damage from wave attack. What is a geosynthetic sand container? Geosynthetic sand containers are geotextile sand-filled bags, containers, or tubes that are manufactured from needle-punched nonwoven geotextiles. For coastal structures, dune security and scour protection, geosynthetic sand containers provides an alternative to conventional rock materials such as riprap, gravel filters and other hard armour and aggregate solutions.